We’re excited to join Downtown Atlanta by walking, recycling and giving back. Join us as we celebrate Sneaker Week! Tie on your sneakers this week and participate in the Sneaker Week walk challenge and scavenger hunt extravaganza. 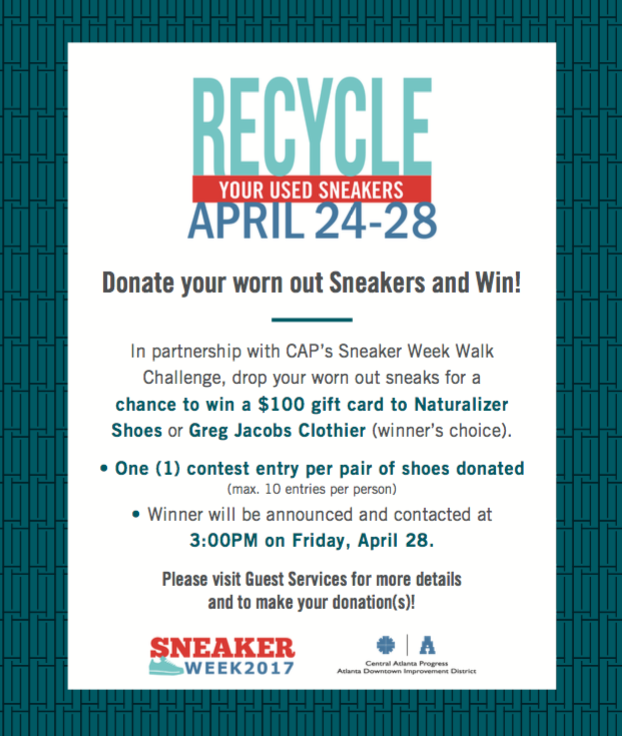 After you complete the Downtown Atlanta walk challenge, drop your worn-out sneakers (or old sneakers you have in your closet at home) in bins located around Peachtree Center from April 24 through April 28. 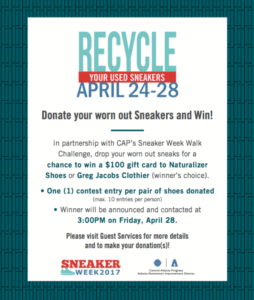 Your donated sneakers will either be cleaned and donated to someone in need or recycled, and for every pair you donate, you will be entered to win an $100 gift card to Gregory Jacobs Clothiers or Naturalizer Shoes.